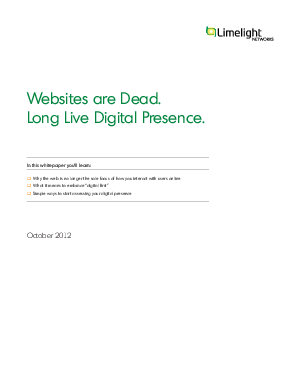 Your website, as you know it, is dead. That’s because digital marketing is no longer about pushing out content and hoping that users or customers read it. It’s about engaging and interacting with your customers through your content. So you can’t just publish your videos to YouTube and be done with it. You have to do more. Your content tells the story of your brand and your company. And when it’s online, it’s your digital presence. The death of “what you think your website is” isn’t exaggerated. New research from Google and others show that your customers are consuming content across devices. It’s a new world now—a world about consistent content experiences, about engagement and interaction using a variety of channels. About digital presence. This whitepaper will help you understand how the digital world has changed over the past 10 years and how you need to start thinking and acting digitally to take advantage of these trends and changing user behavior. Either that...or your story will never stick.